An easy peasy comforting lentil salad tossed with a simple white balsamic vinaigrette served on the thinly sliced Mozzarella. The salad can be served as a side dish or as the main course with some crunchy toasted bread. Combine lentils with 3-4 cups water. Bring to a boil. Simmer 25-30 minutes, until lentils are tender. When lentils are done cooking, drain then place them in a large mixing bowl. Peel and dice the shallot. Finely dice the cherry radishes.Drain and cut the Mozzarella into thin slices. Arrange them in two serving plates. Mix together the vegetable stock,Balsamic bianco, mustard, salt and pepper in a bowl. Beat in walnut oil. 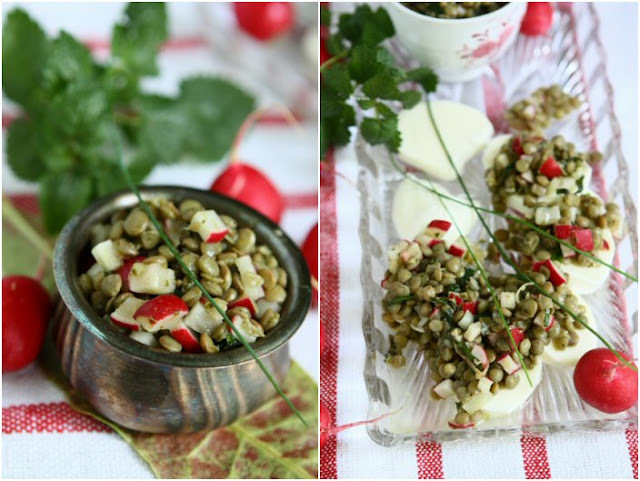 Add diced shallot, cherry radishes, and chopped chives to the lentil together with dressing. Season with salt and pepper. Divide the lentils and mound onto the Mozzarella. Garnish with chives. I LOVE mozzarella and I like lentils, but I've never tried to combine them together. This dish sounds very Italian. Great quick dinner idea Angie, Thanks. I've also found that lentils and balsamic vinegar go really well together. The radishes would give this salad a nice texture, too. Love it! Sounds wonderful and fresh! Love the use of lentils in a salad. Kudos!! I should use lentils more, they're so tasty!! Great salad. Angies, I always love your beautiful salads you made. Looks very delicious and healthy. What a great salad! Everything about it. Lentil and cheese sound like a really delicious and healthy combination. Would love to try this out sometime. What a gorgeous salad! love the use of cherry radish here! Another great salad Angie; do you mean fresh mozzarella? What a fabulous way to serve lentil salad on the thinly sliced Mozzarella. Lentil salads are fabulous (and filling) for lunch. There is plenty of summer left to include a dish like this. Rock on, Angie. You always come up with some creative and delicious. This is right up my alley! Another creative and wonderful dish , Angie ! Love lentils in any form. Your recipe sounds amazing! Healthy salad. Looks pretty with the mozzarella cheese. OMG! Lentil and mozzarella. What a nice combination. I bet its delicious and to die for. This is a wonderful salad..looks yumm. would love to try it. Serving these lovely lentils on mozzarella is such a great idea. Indeed would make a great 'sandwich' too. Very creative. love the recipe...lentils are my favorite! Awesome! I've been wondering what to do with my packet of lentil in my pantry! And this recipe is absolutely fantastic for my diet! Looks so appetizing & great the season! YUM! This looks so easy and so good. Your photos are lovely! Did you say lentils? And mozzarella? Two of my favorite ingredients, and radishes to boot. My kind of salad! love brown lentils, it compliment any dish. Your salad looks really good! For those of us trying to improve our nutrition and including more legumes, this recipe with a bit of mozzarella is just perfect Angie! Thank you so much for helping me! I have red lentils that would be fun with this dish. Walnut oil is my new favorite choice when it comes to salad type recipes. I love the flavor it adds. I use lentils a lot. thanks for this salad idea. Love your beautiful presentation too, Angie. I never tasted the combo of cooked lentils with mozzerella! What a tasty & unique combo! It must be heavenly! :) Yummm! I love all the different flavors together here, Angie. I never would have thought to pair them. Nice job! What a beautifully healthy salad! I have to be honest that I'm not a big fan of lentils because I've only had them in soups and they are usually overcooked and not much flavor, but these lentils look great! Lots of texture and then the white balsamic and walnut oil vinaigrette sounds delicious! 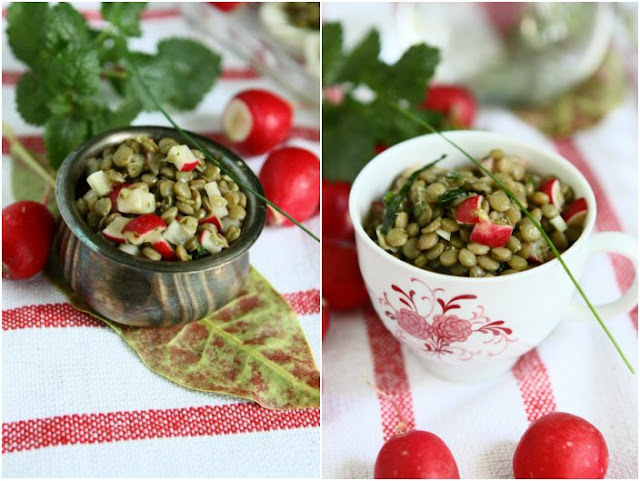 Lentils are such a great healthy food and this salad looks fabulous!! It looks so tasty and so healthy!! Oh, I love this! Lentil salad is one of my favorite things to have for lunch. Definitely going to make this soon! I love lentils and these look amazing! This salad looks delicious, beautiful photos! I love lentils (I have a bag of it sitting which is screaming to be made into this salad right now, or maybe it's just my tummy). This salad has all my favorite things in it and I love the balsamic-mustardy dressing! I love lentils and this salad looks delicious and sounds amazing,Angie! I love the mozzarella idea! You make the most uniquely beautiful salads Angie! This is stunning! i just love the mozzarella and chives in here! sounds like a super delicious salad, and i just love your photos! Who else could make lentils look so pretty. Love your recipe and can't stop starring at your photos! I've been thinking of making lentils the last couple of weeks - love this presentation! First of all - amazing presentation :) And mozzarella - I love it. Some people say it has no taste, but for me it's delicious and i like the texture. Great idea. I love making lentil salads...and then eating them throughout the week. This looks especially flavorful and anything with mozzarella makes me a very happy person! Thank you for sharing! Lentils are one of my favorite foods! Your recipe sounds so so good. I've never eaten lentils with mozzarella but can imagine how great they must taste. Oh, how I love to taste this! Balsamic vinaigrette and soft mozzarella are my favorite and lentils are staple. In all this is a perfect salad for me. Hi Angie, very pretty salad, look very appetizing. Love your presentation. I'm so glad that I am backtracking to the missed posts. Lentils are a huge favorites of ours, and Lora cooks lentils once a week. I will save this yummy combination to make this salad. Love the mozzarella, and the radish addition...as a matter of fact, I made some pickled red little radishes that would go so well in this yummy salad! I like the subtle flavor of mozzarella with this lentil salad than the more traditional feta or other sharp crumbly cheese. Nice touch! I adore this lentil salad. Looks fantastic...especially over fresh mozzarella. They look divine! Lentils and mozzarella...who would've thought, great suggestion. My favorite combination! It looks wonderful on the photos.